It’s simple to make, deliciously jolly and will put smiles on the faces of all your favorite holiday revelers. 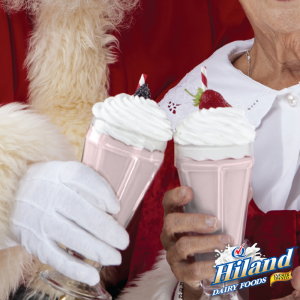 It’s the Santa Shake, and it has become one of our favorite holiday refreshments. Make this tasty treat for your family and guests — and plan on everyone asking for seconds! Combine equal parts egg nog and ice cream. Using a blender, blend completely (about 30 seconds). Pour into glass and top with whipped cream and crushed candy canes.